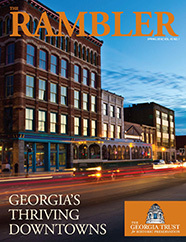 The RAMBLER is The Georgia Trust’s quarterly publication. It is distributed to members of The Georgia Trust and to national preservation organizations. The purpose of this handbook is to provide a comprehensive resource for the state of Georgia that promotes citizen involvement and explains preservation practices. Architect J. Neel Reid (and his partners in Hentz, Reid & Adler) founded the Georgia school of classicists after study at Columbia University and abroad. Read more.